As Nocebo is the second of a trilogy, we’re traveling back in time to start with Isthmus. Two years ago, the Iranian duo of Nima Aghiani and Sara Bigdeli Shamloo (9T Antiope) released their second album as part of Eilean Records’ winter slate. The album, like most of the duo’s music, remains incredibly hard to classify. 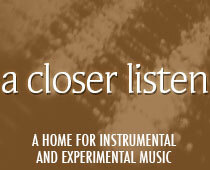 The opener “Prophase” includes cello drone, cold wind, footsteps on snow, car horns, conversation and folklike vocals. The cumulative effect is mesmerizing. At the time of released, Isthmus stood alone, waiting for a theme. This arrives with Nocebo, as the duo writes of “alternate worlds” and “beings who have given up on their space and time, forcing themselves into complete isolation and eventually a self-induced comatose state.” It’s hard not to connect the theme to the unrest in Iran, years of cumulative turmoil producing an unsettled state of mind. Given such stark history, wouldn’t one want to retreat, cocoon, and dream of different realities? “How you run far” Shamloo seems to be singing in “Metaphase.” Imagination is the only viable escape. The mind of shared dreamers produces the tapestry of a new Iran, comprised of elements old and new. We imagine art, faith and family ties preserved, religious enmity and mistrust removed. Worlds collide in “Anaphase,” as morse code static attempts to break through, balanced by the sound of distant chimes. The closer “Telophase” comes across as a prayer and a plea, the vocals finally upfront, pressed against howling glissandos. While Shamloo sings of dreams, she settles on repetitions of “sweet,” despite the disruptions around her. Finally the waves arrive, crashing on an impassive shore. And now to the new cassette, two sidelong compositions that slide from the grasp whenever one tries to define them. The mood is darker, the vocals sparser, more spoken than sung. The tape begins with factory-style sounds reminiscent of Test Dept. and their experimental industrial peers. Something bad has already happened, we know not what. And then a stop, a static charge, a brief monologue: when will the dark begin? This is turn is followed by even harsher sounds, like electric saws and drill guns, like thoughts being deconstructed and examined. Carry on with strife, intones Shamloo, the sediment of death. Have conditions deteriorated to the point that song has fallen prey to poetry, melody to abrasion? The recording is claustrophobic, menacing, jaded. This is the proper place for such a downward slide, as the tape sits in the spot of The Empire Strikes Back, the big question being, what happens next? We knew that Han Solo would be rescued; we’re less sure about the dreamers of Iran. And just as hope seems discarded, a choral segment offers a reminder of the comatose state. While it won’t last ~ falling prey to buzzing drones, electronic pulses and in the sixteenth minute, those pesky glissandos again ~ it’s strong enough to be remembered, even when the poetry returns, stuttered like a digitally corrupted transmission.